Hello Spring ~ Hello Birdies chirping in the trees ~ Hello Sunshine peeking through the windows ~ Hello oh no ~ dust and lots of it! Friends the time has come to wash away the winter webs and begin the annual tradition of Spring Cleaning! It doesn’t matter if it’s the kitchen counters, the bathroom sink, in the car or on the barbells in the basement, they all need to be cleaned. 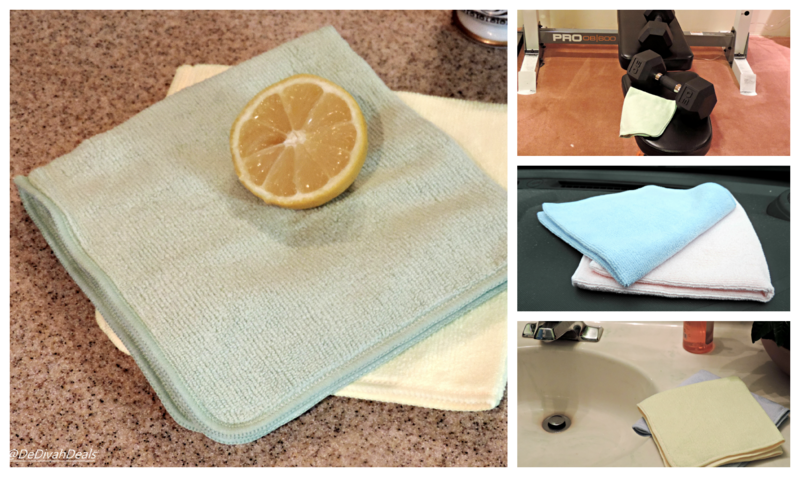 These Microfiber Cloths by VibraWipe are a great alternative to paper towels and are strong enough to clean all areas in your home. They are soft, and non abrasive so they can be used on glass and delicate bulbs…don’t forget that Dining Room chandelier. They are lint-free and won’t streak so they are great on mirrors and glass doors, are super absorbent which is perfect for the kitchen and bathroom sinks. The Microfiber Cloths come 8 to a pack in 4 pastel colors so you can leave one in each room then throw them into the washer to keep them clean and ready for the next use. So go ahead and fling back those curtains and raise those blinds, just be sure to have a VibraWipe Microfiber cloth handy to catch all the dust. Yep! We got about two inches but it’s all gone now thank goodness. I need some of these for dusting. I have one microfiber cloth hat came with some type of cleaning product that I bought. I like it a lot and need more of them around the house. Yes, I have one in every room, that way I am not searching when the dust builds up.